Here at GMAutoflow we are always looking to introduce you to top quality, cost effective ways of filtering your water. Cintropur are a company based in Belgium offering a wide range of water filtration systems as well as a rapidly expanding U.V range. These systems are ideal for private water supplies, rainwater treatment, irrigation & spraying as well as many types of process water applications in order to cope with the most demanding Water treatment applications. GMAutoflow are one of the largest suppliers of Cintropur products in the UK and have been involved with these products for 15 years. The range encompasses small filters for protection of domestic supplies up to large commercial units for process water up to 32m3 per hour flow rates with DN80 flanged connections in a single unit. 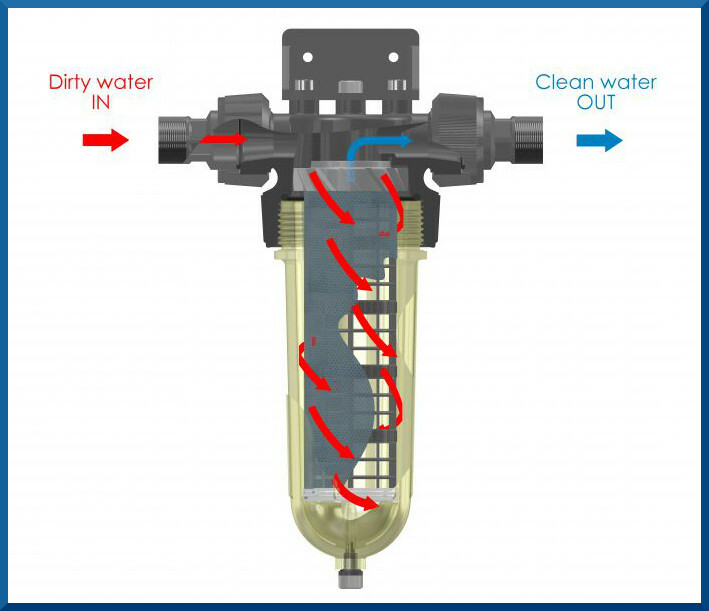 The water filter systems use a cyclonic type effect within the filter which allows large particles to be collected in the bottom of the filter bowl. This allows the system to offer high flow rates combined with long filter life and low ongoing replacement filter costs. The Cintropur filters (or socks as they also known) are available across the range in different grades from 1 micron high grade disposable filters up to 300 micron nylon washable options. Cintropur sell a range of carbon filter systems which can be combined with their sediment filters where you need colour and taste & odour reduction. The latest products are a range of U.V systems that can be combined with the filtration systems or as a stand alone compact U.V system with a flow rate of up to 10m3 per hour. Whatever the application, domestic treatment, process water, rainwater treatment, irrigation, chilled water systems in fact anywhere where you require excellent results combined with high flow rates at a cost effective price then the Cintropur range is for you. At GMAutoflow we stock a wide range of commercial water softeners, water filters and U.V equipment. See our ecommerce web site www.gmautoflow..co.uk, selling to customers all over the world. Or call us for a chat on 0845 10 80 685 (local call rate) or 01403 700794 and one of our friendly staff will gladly talk you through your options. U.V. Systems.....have you seen the light? There has always been a standard range of systems that we supply for the treatment of small domestic dwellings up to larger commercial systems, usually for drinking water applications, from well established manufacturers. We are fortunate to work with manufacturers who allow us to specify and build bespoke systems to meet any application and to customers particular specifications. We have provided systems for private water supplies such as boreholes and well water, breweries, fire service vehicles and irrigation and washing systems for vegetable processing companies that need to target particular issues. We have provided systems for zoos to keep the water in seal enclosures clean and clear, systems for patrol boats for Her Majesty's Customs Service, treating test tanks for sonar systems and even for testing mini submarines!! So if you have a particular UV water treatment requirement, no matter how obscure, then give us a call as you may well find that we have already done something similar.